This is the wall between the front door and the front windows. Never mind about the cobwebs. At this time of year, I am sweeping cobwebs off everything and two days later, some tiny spider the size of the period at the end of the sentence, has built a web in the exact space. Add a shedding black cat and I'm removing cobwebs festooned with cat hair from the same spot sometimes twice a day. But this post isn't about cobwebs. The last weekend in June, someone tossed their lunch in the middle of the night. I think it was Mija because, when I jumped out of bed to clean it up, she was the one who ran. They don't seem to understand I'm not mad at them. It happens. I just need to clean it up before it hardens into something I'll need a hammer and chisel to get off the floor. I couldn't find it. I didn't see any place on the floor where there was a pile of something. So, I assumed it was dry heaves and went back to bed. Meh, it happens. Sunday, June 26th, I'm seated at the table in the living room, eating breakfast and reading a newspaper. Out of the corner of my eye I see something moving on the windowsill. It's an ant but it's not just any ant, it's a whole army of ants. I follow them to the right and they are going off the windowsill, down the side of the wall and out of the house between the door and the threshold. My first instinct was to grab the ant killer and spray the heck out of them. I don't want any ants in the house and certainly not what appears to be a whole colony marching across the windowsill in the living room. But, I decided to see where they were going. I followed them to the left and there, on the windowsill, was what had been upchucked. Ants were all over it. Yes, that is certainly an "ewww" moment, but it was also kind of fascinating. 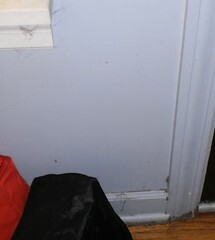 Some of the debris had missed the sill and had fallen on the floor and ants were all over that as well. I decided to let them clean it up to see just how thorough they would be and how fast this would take them. Man did that take self-restraint. Every time I walked into the living room, I checked on their progress. It took them 3 days, working around the clock, but by Wednesday evening, June 28th, the piles had been reduced to a couple of small items that were too hard to break down. The ants were gone, no trace that they had even been in the house. I have since washed the area where the trails were as well as the area where Mija tossed her supper. I was quite amazed by their thoroughness. Now, I wouldn't do that if the ants had been in my kitchen. In fact, I've found them in dishes in the sink and immediately, I spray and clean. The kitchen is NOT the place for ants. This was different and it was fascinating to see them at work. I have not seen an ant in the living room since so I'm not worried they have scouts looking for the next meal. I'll still clean something up as soon as I find it. It was fun once, but not a second time.